Located in the charming village of Haybes, a village ranked as a "station verte" (natural tourist area), in the heart of the Ardennes, the hotel-restaurant "au Saint Hubert" welcomes you to its classy and comfortable setting on the banks of the Meuse and along the Trans'Ardennes greenway. In the doorway of the hotel, you already feel like at home. Maxence and its team bring everything into play in order to facilitate your stay and give you the opportunity to enjoy totally your holidays in the Ardenne. We feel the effect of the passion for its territory through the decoration of each bedroom and the generosity of the meals served in the restaurant ensure an exceptional stay. 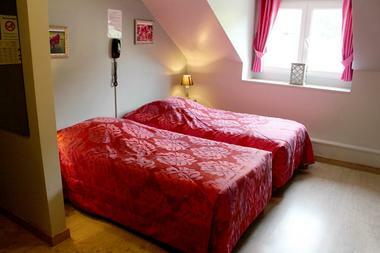 "Au Saint-Hubert" is an hotel with 10 original bedrooms, well decorated. 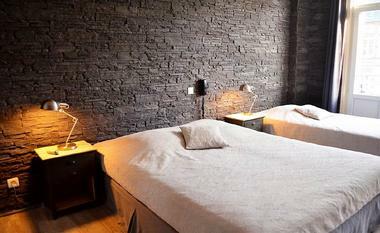 The chosen themes : The slate and the legends make unique each bedroom and invite you in the history of this country. The bedrooms are spacious and comfortably equipped : Telephone, television, wifi access and hair-dryer. 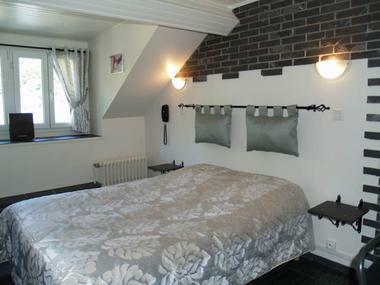 The bedrooms offer a view over the river Meuse or over the delightful village of Haybes. Ideally situated, during your stay, we suggest you to visit the towns of Givet : http://http://www.valdardennetourisme.com/givet-et-ses-portes/givet/tabid/10692/offreid/df67b1b9-601e-4edc-b9b3-fe0d5c865e5f/detail.aspx and Fumay : http://http://www.valdardennetourisme.com/centre-ville-historique-de-fumay/fumay/tabid/8239/offreid/6fe83de1-95cf-48d2-bf98-3cf7ab619292/detail.aspx , the roman camp : http://http://www.valdardennetourisme.com/visite-guidee-groupes-le-mont-bayart-vireux-molhain/vireux-molhain/tabid/10699/offreid/05a55e88-1124-413c-a6d3-1d89e53e5528/detail.aspx and the collegiate church : http://http://www.valdardennetourisme.com/collegiale-saint-ermel/vireux-molhain/tabid/8241/offreid/f1d806e7-d0d2-43ab-af4b-4f99200def93/detail.aspx of Vireux-Molhain, the castle of Hierges : http://http://www.valdardennetourisme.com/61/hierges/tabid/10692/offreid/e0e59b49-f9dd-42b8-8a8e-be87c02a4570/detail.aspx , the European centre for Art and Crafts : http://http://www.valdardennetourisme.com/centre-europeen-des-metiers-d-art-cema/givet/tabid/8243/offreid/242f29a7-72b3-4306-9ce2-fe5e22ca00da/detail.aspx , the Nichet cave : http://http://www.valdardennetourisme.com/61/fromelennes/tabid/8240/offreid/db9a5ba5-7590-4a57-8dc2-413807b40041/detail.aspx . You have also the opportunity to discover the adventure in the "Terraltitude" park : http://http://www.valdardennetourisme.com/parc-de-loisirs-terraltitude/fumay/tabid/10949/offreid/547bdbcd-f5f5-4723-abaa-f1c370822fc7/detail.aspx or go for a walk in the forest or along the cycle path "The green track Trans'Ardennes". 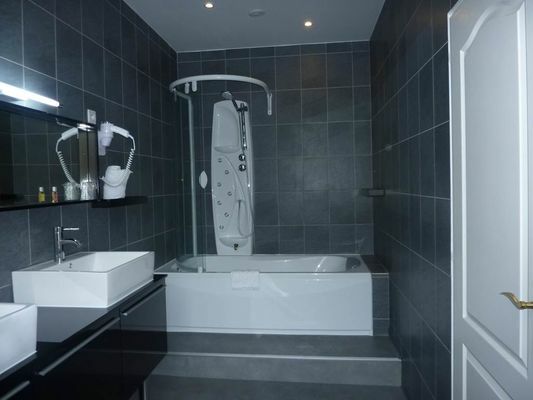 If you want to relax yourself, the centre of aquatic leisure Rivea : http://http://www.valdardennetourisme.com/61/givet/tabid/8236/offreid/020edbe1-e9d8-449b-ba41-26e89c4ee41b/detail.aspx offers you its well-being area. 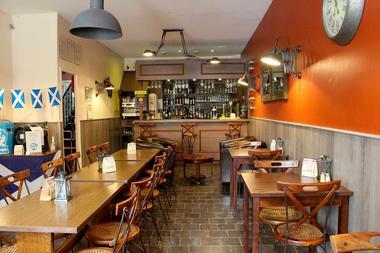 - Every morning, you have the possibility to enjoy a copious "ardennais" breakfast (buffet breakfast). 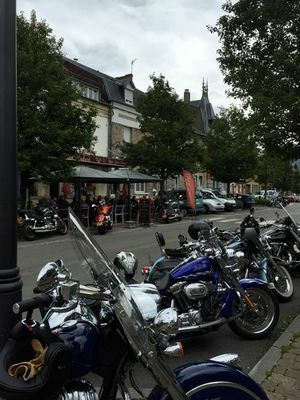 After your stay in the Ardenne ? After this "ardennaise" experience, you will come back home with a lot of souvenirs... the unspoiled landscapes, the warm welcome, the wonderful landscapes which take your breath away. 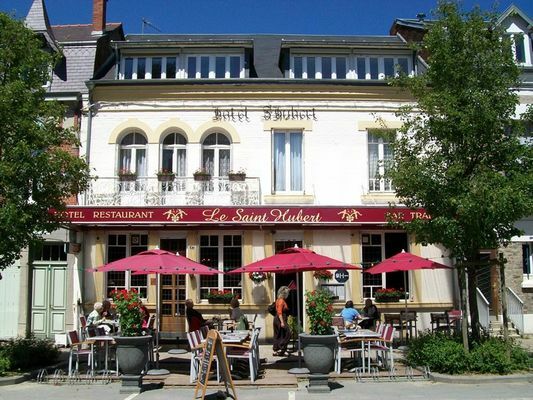 Do not hesitate to let your advice : http://http://www.ardenne-insolite.com/blog/2011/06/01/lhotel-restaurant-le-saint-hubert/ and share your experience.